Translation: The jarabe (dance type) of the Tapatíos (natives of Jalisco). Other names: Jarabe Jalisciense (a prior name for the unabridged version); Jarabe Largo Ranchero (another prior name for the unabridged version); Mexican Hat Dance. Music: Far and above all other recordings, we prefer: RCA Victor MKS 1448, Bailes Regionales de México; A-1, Jarabe Tapatío. Formation: Longways set, all facing front, woman to man's R, inside hands joined with partner (man's R hand holding woman's L hand shoulder-high). Atole Steps (milk-drink) step (1 per bar): step diagonally forward to R: onto R foot, behind and to R of R foot onto L foot, onto R foot (cts 1,2,3). Bend R shoulder slightly forward and down and sway to R. R hand with skirt moves forward; L hand stays back. To repeat step, use opposite footwork, handwork, and direction. Hojas de té (leaves of tea) step (1 per bar): stamp in front of L foot onto R foot, R toes turned a bit to L (ct 1), stamp in place or slightly forward onto: L foot, R foot, L foot (cts 2,3,4), hop a bit backward on L foot, lifting R heel slightly up and out (ct 5). Skirts (held out to sides) wave back (cts 1-3), and forward (cts 4-6). Mecedora Steps (rocking chair) step (2 cts per step): step behind L foot onto R foot, lifting L foot across and in front of R foot, L toe near floor (ct 1), step in front of R foot onto L foot, lifting R foot across and behind L foot, R toe near floor (ct 2). Repeat with same footwork. L foot remains in front of R foot throughout. Push Steps to L (1 per ct): step to L onto L foot with bent L knee, while "pushing" to R with R foot (ct 1), step beside L foot onto ball of R foot (ct &). Hold skirt high on the L side. Push Steps to R uses opposite footwork and skirtwork. Zapateado Triple Steps (zapateado = shoe-done-thing) step (2 per bar): hold skirts out to sides with both hands. Wave L skirt forward and stamp: forward onto R foot, beside R foot onto L foot, onto R foot (cts 1,2,3), repeat cts 1-3 with opposite footwork and waving R skirt forward (cts 4-6). Jarabe, as a generic dance term, mirrors much of post-Colombian (Mexican) history, reflecting social customs, oppression, and nationalism. Originally meaning "syrup," jarabe became a term of endearment which then became the name for a romantic courting dance. The church, of course, forbade it. Indigenous to Mexico, the jarabe came to symbolize Mexican nationalism, so in 1802 Felix Berenger de Marquina, Spanish Viceroy of New Spain, declared the Jaravo gatuno to be immoral: five years prison for dancers and two for observers (plus, presumably, eternal damnation). Times changed, and 62 years later Emperor Maximilian included the jarabe in the first autonomously-produced Mexican ball. Ironically, Mexican independence fighters also danced jarabe, particularly on May 4, 1867, and particularly one known as Jarabe Largo Ranchero(1), or Jarabe Jalisciense. Thus encouraged, they defeated Maximilian's soldiers the next morning, giving the town of Puebla new significance and the Mexican calendar a new holiday  Cinco de Mayo. In 1924, following the romantic nationalism movement sweeping post-war Europe, Mexico commissioned the Secretar&237;a de Educación Pública the S.E.P. (National Board of Education), to synthesize the much shorter (2 ½ minute) Jarabe Tapatío from the overly long (6 minute) Jarabe Largo Ranchero. By proclamation of the Federal Government, Jarabe Tapatío became the national dance of Mexico, signifying the unification of the republic. On the outskirts of Guadalajara, capital city of the state of Jalisco, live people known as Los Tapatíos. They, with other Jaliscans, possess a strong horse culture and, not uncommonly, bowlegged men (women ride sidesaddle). Thus, bowlegged posture suits men in Jarabe Tapatío. As in other jarabes, courtship of the china by her charro provides the theme. During the dance, the charro throws his most prized (and expensive) possession, his sombrero, on the floor. The china accepts him when she dances on its brim and puts the hat on her own head. Sometimes called the Mexican Hat Dance(2), Jarabe Tapatìo ends with La Diana, a military tune signifying triumph and expressing congratulations to the charro for winning his china. Alura Flores de Angeles(3) learned this dance from the S.E.P. She told me, in fact, that she served on that 1924 S.E.P. standardization committee, but she would have been 19 at the time and I may have misunderstood. She introduced her version to the United States in 1954 at Texas Folk Dance Camp, presented it for the next 40 years wherever she taught, and seldom taught it the same way twice. Alura explained the folkloric process of her Mexican dance choreographies thus: "It changes like the butterfly to become more beautiful." I worked with her for about 20 years, trying to pin down a version to fit most situations, and have described it here. Other folk dance teachers learned Jarabe Tapatío while traveling in Mexico. Vyts Beliajus learned it in the early 1940s and would occasionally remember an unauthorized step well enough to demonstrate it to me. The inimitable Bill Stewart learned it in the early 1950s and shared with me some of its history. I appreciate the help of both. 1 ct Woman turns CCW in place under the man's R arm. Back away from each other to approximately 2 meters apart. (6/8) 1. The charro gallops to see his china. 1-7 Dance 14 Zapateado Triple Steps forward to meet partner with R shoulders adjacent. 8 Stamp in place with R foot, no weight (ct 1). 9-16 Repeat action of bars 1-8, advancing to partner's place and turning CW to face partner. 2. The charro knocks on the china's front door. 1-16 Dance floor pattern of step 1 using Knocking Steps, returning to original positions. Don't forget the stamps in bars 8 and 16. 3. The charro takes his horse to the stable. 1-8 Dance 16 Zapateado Triple Steps, advancing to partner's place and turning CW to face partner. No weight on last step. Note: You now stand in your partner’s place. Recapitulation: Our hero the charro rode to see his sweetheart the china. He rode straight, did that charro, pausing only to think of his intended. Arriving at her hacienda (ranch house), he dismounted and knocked on the (probably ornately-carved and studded with iron) huge front door. So large was that hacienda and so thick the door that he paused to reflect again upon his beloved before resuming the knocking. Finding our heroine, the china, not home, the charro, ever the true horseman, stabled his horse. By most fortunate coincidence, the charro and china then meet on the street! Imagine  if they had not met, the dance would end here! (3/4) 4. Coqueteo (flirting). They flirt, and the china remains aloof. 1 Run 3 steps toward partner onto: R foot, L foot, R foot (cts 1,2,3). 2 Pivot once CW on R foot by touching L toe across R foot and pushing with L toe. 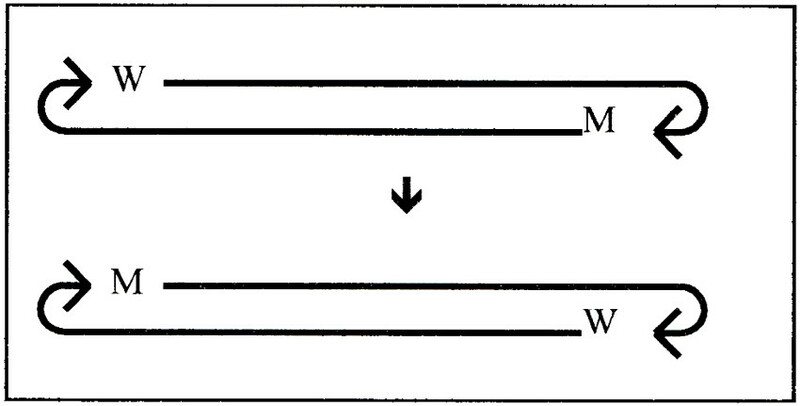 Shift weight onto L foot (ct 3), having turned once. The turn starts and ends with R shoulders adjacent. 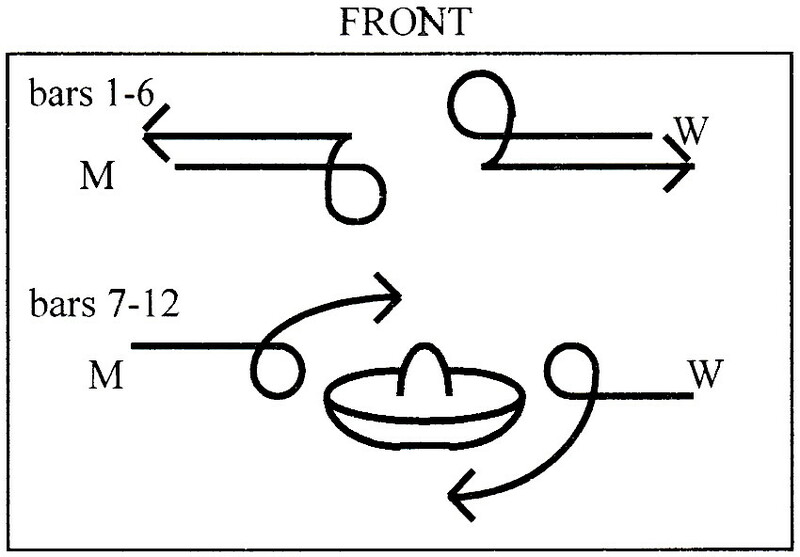 3-4 Repeat action of bars 1-2, dancing to partner's place and turning CW to face partner. End with weight on R foot. 5 Turn once CCW with 3 steps onto: L foot, R foot, L foot (cts 1,2,3). 6 Stamp in place with R foot, no weight (ct 1). 7-8 Repeat action of bars 5-6 with opposite footwork and direction (CW). Take weight on last stamp. 9-12 Repeat action of bars 5-8 (turn CCW, CW, CCW, and CW). 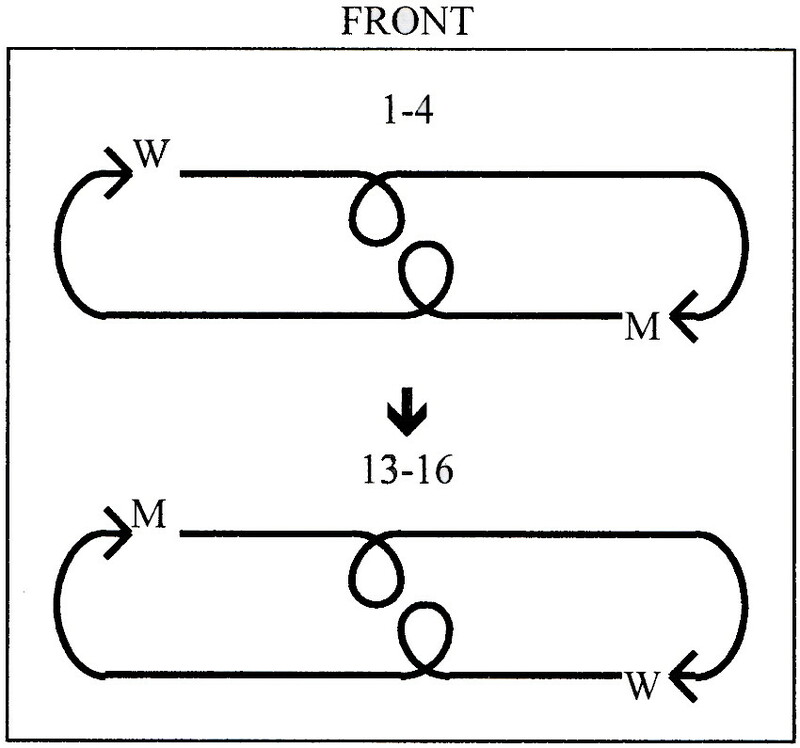 13-24 Repeat action of bars 1-12, returning to place. 5. El Atole. Facing rejection, the charro seeks solace in his tequila bottle. 1-6 Dance 6 Atole Steps, advancing to partner's place. 7-8 Dance 3 Mecedora Steps, starting back onto R foot and turning CW to end facing partner. 9-15 Repeat action of bars 1-7 (6 Atole Steps and 1 ½ Mecedora Steps), returning to own place. 16 Stamp beside R foot onto L foot. (6/8) 6. Hojas de té. The china serves the charro hot tea to sober him up. 1-16 Dance floor-pattern of step 1 with Hojas de té Steps. Don't forget the stamps in bars 8 and 16. End in original starting position, with man and woman on their own sides of the dance. Recapitulation: The charro and china flirt, and she rejects him. Don’t you just hate it when that happens? The charro did! So he got drunk, returned, and the china took pity on him. Hmmm . . . How come that never worked for me? (2/4) 7. El palomo (the dove). This step mimics doves making love. Flirting resumes and the charro offers his sombrero. 1-2 Run forward 4 steps onto: R foot, L foot, R foot, L foot (cts 1,2,1,2). 3 Quebrado with weight (step to R onto outer edge of R foot) (ct 1), step across R foot onto L foot (ct 2). Turn once CW during bar 3. Note: Quebrado imitates a horse twisting its ankles and endangers our human ankles. Be careful! 4 Facing partner, stamp onto R foot (ct 1). 5 Turning 90° CCW, dance 2 push-steps to place, starting onto L foot. Or, step onto: L foot, R foot (cts 1,2). 6 Stamp onto L foot (ct 1). 7-11 Repeat action of bars 1-5, but stay near partner. Man puts sombrero on the floor during bar 10. 12 Dance 2 more push-steps to L around sombrero CW. 8. The china considers the charro's proposal and accepts (or not!). 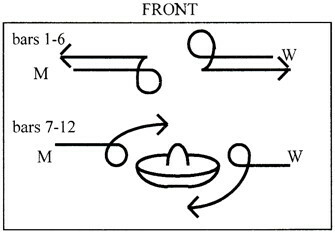 1-8 Circle sombrero CCW with 16 push-steps to L.
9-16 Circle sombrero CW or CCW with 8 Mecedora Steps, starting on ct 2 of bar 8 and rocking back onto R foot. Return to starting formation. With R foot always behind L foot, woman leaps into hat brim onto L foot, touching R toe to brim behind L foot (ct 1), small leap back onto R foot, touching L toe to brim in front of R foot (ct 2). Woman travels around brim CW with 8 of these tapping Mecedora Steps, leaving hat on ct 2 of bar 16. Man continues push-step to L.
17-19 Woman drops to R knee, picks up sombrero, puts it on her own head (signifying acceptance of the charro), and stands up, holding sombrero on head with R hand. Man swings R leg to L and over the head of the kneeling woman, crosses R toe over L foot, and pivots once CCW in place. Recapitulation: After the hot tea, the charro and china flirt again, and the charro lays his most prized possession, his sombrero, at the feet of the china. She considers the offer for a moment and then (we and the charro sincerely hope) accepts the charro by either dancing daintily in the brim of the sombrero or by placing the sombrero on her head. I don’t think I can adequately explain why the charro swings his leg over the china’s head. Use your imagination. (2/8) 9. La Diana. All celebrate the charro's winning his china. 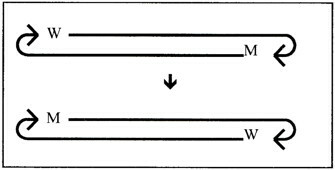 1-2 Face front and join inside hands (man's R to woman's L), shoulder-high. Woman continues to hold sombrero on head with R hand. Man places L hand at the small of his back. Dance forward with 4 step-hops, starting onto R foot and stepping one foot in front of the other as if on a tightrope. 3-4 Repeat action of bars 1-2, moving backward. 9-10 Hop 3 times on L foot (cts 1,2,1), touching: R heel diagonally forward to R (ct 1), R toe across and in front of L foot (ct 2), R heel diagonally forward to R (ct 1). Hop, landing with both feet together and knees bent a bit (ct 2). 11-12 Repeat action of bars 9-10 with opposite footwork. 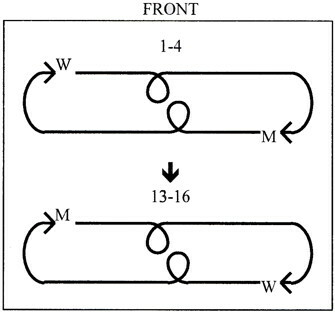 13-16 Repeat action of bars 9-12. 17-23 Repeat action of bars 1-7. 24 Man: step forward onto R foot and turn the W once CCW under your R arm. Then step back onto L foot and drop to your L knee, R foot (and knee) toward the W.
Both hide behind the sombrero and kiss, as they are now engaged! All answer "¡Viva!" Alura always admonished us to yell ¡Viva! quickly, not ¡Viv-a-a-a!" Jarabe describes the medley of a series of soñés; these could be from just one state or common to several states, especially when they are neighboring states. Although this jarabe was originated in the state of Jalisco, most of the soñés for this dance are common to all the regions of El Bajío: Guanajuato, Michoacën, Jalisco, Aguascalientes, and Querétaro. This Jarabe is accompanied by any musical ensemble. The first soñ is from Jalisco. The first part shows very clearly the characteristics of the Spanish zapateado, but in the accompaniment there is a reminiscence of the Walona which is an heritage from Belgium. The second part is exactly a zapateado. she's angry she wants to hit me with a stick. who thought that I was going to let her act! Professor Higinio S. Vázquez composed for this jarabe several verses, which we won't give, because they aren't considered to be within our traditional artistic manifestations. to see the love that I have. What do you say, mama, do you let me go? I won't be late, I'll be back soon. This is a zapateado in a triple rhythm which is very characteristic of this style. Number 3 takes the name El Atole (beverage made with milk, corn meal, wheat, and flavoring) and is also a zapateado like the one before. We present one of the verses in which you can see, as in the one before, the sense of humor of the people. the atolera is getting irritated. What if she asked me to kiss her. Then I will get angry. there is a sparrow hawk flying. Do not get frightened little doves. to those who are walking by. Number 6 and the finale, called La Diana, is a happy music in a vivid movement. It is used in all the finales of the fiestas in honor of the actors and artists, and also to celebrate or flatter certain particular persons. In this jarabe the final number has been included to demonstrate a maximum of happiness when we finish the dance. (1) In the lexicon of our plebeian people, to make the morning or to take the morning means to take a glass of wine before breakfast. Alura wrote this, the first of five articles for Real Mexico magazine, for their April-May 1934 issue. Dancing is spontaneous. It is very very old as a study of the art will prove. People seem always to have danced. From the earliest times dancing has been closely linked with music. Indeed some authorities appear not to know which of these two arts came first. It was probably music, but dancing followed close on the heels of music. In our somewhat artificial civilization people dance at parties or balls or in cabarets when they are happy or when they are bored, but primitive people seem to have danced for everything, not only when they were happy, but when they were sad too, or when they were angry; and when they were frightened, perhaps by some strange elemental thing they could not understand, they danced to propitiate their gods. A study of dancing in Mexico is very interesting, for it includes the spontaneous dances which expressed the character and thoughts and aspirations of the natives, and also because some of the dances of Spain are danced here, though the Mexicans have grafted on to these imported dances their own individuality. Of all the fascinating and vivid dances that are danced in Mexico, the one most familiar to the world at large is the Jarabe Tapatío. This is the traditional dance of the State of Jalisco, in the west of Mexico, but it has been danced all over the Republic, and it appeals so strongly to the imagination of the Mexican people that it has come to be recognized as the national dance. Most Mexican fiestas end with the dancing of the jarabe, and a fitting climax it is, for the air is filled with cheers, the clapping of hands and the stamping of feet to the beat of the music, which differs in the various parts of Mexico, as different states prefer different music to accompany the jarabe. The jarabe is danced by the two national figures of Mexico, the charro, or typical Mexican horseman, and the china poblana. There is a beautiful legend about the china poblana which has endeared her to the Mexican people. According to the story, a little Chinese girl of royal blood, who had been captured by pirates and taken to Manila, was there sold by them to a Portuguese merchant from Acapulco on the west coast of Mexico. This Portuguese merchant had been commissioned by Captain Angel de Sosa, a Spanish gentleman of Puebla, to bring back from the Orient as a companion for don Angel's wife, doña Margarita de Chavez, "una chinita" (a little Chinese girl). The exquisite Oriental child so ingratiated herself into the affections of her foster parents that they made her their heiress. They had her baptized in the Christian religion, calling her by the name Catarina de San Juan. Years later, after the death of don Angel and doña Margarita, Catarina devoted her life to charity, helping the poor and friendless of Puebla. The humble and the oppressed looked up to her as to a patron saint, and they began to imitate the dress that she wore. This was simply the ordinary dress of the day for women, but Catarina wore a red skirt and a green waistband. And the skirt was embroidered with Chinese symbols which added to its appearance of fantasy, so that in time Catarina came to be known as the china poblana, or the Chinese woman of Puebla. The dress which Catarina adapted to her own taste resembled closely the Spanish costume of that period. It consisted of a plain skirt, which evolved into the "castor rojo," or red skirt of the china poblana, the white blouse, and the rebozo (shawl), the pañoleta (handkerchief), and the slippers. Of course, in time, when the jarabe became popular among the wealthier classes of Mexico at their fiestas, the costume of the china poblana was made of finer materials and worked with rich designs. The little highheeled shoes in which the china dances are now of lustrous satin in red or green. To describe the riding costume of the charro, the china poblana's partner in the jarabe, I shall quote from Mr. Lucas de Palacio's authoritative article "The Jaripeo," which was published in Real Mexico for August-September 1933. Spanish riding costumes became gradually transformed in New Spain, naturally being adapted to local necessities and taste, and eventually evolved into the manly and elegant charro suit. The charro or "jarano" hat of the national costume is at present worn with a high crown and a broad brim. In the time of our forefathers it consisted of a low crown, broad brim and a thick "toquilla," a silver or gold cord. Even today the height of the crown and width of the brim vary in different regions of Mexico. The shirt worn by the charro has a folded and low collar and with it he wears a butterfly necktie. The shirt worn today is of fine linen and white, but in earlier days the color of the shirt reflected the political ideas of its wearer. The jacket is short, so as not to molest the rider in the saddle and leave room for exercises, and it is often made of chamois but sometimes of cloth. It is usually elaborately embroidered and has three buttons on each side, although only the upper ones are fastened. The trousers are closely adjusted to the leg and may be of cloth of especially elastic material or of chamois; they may be adorned with silver buttons of varying splendor, or they may have no buttons at all, being simply finished down the side with a fold or wing of material, which may be either narrow or wide. The "calzoneras" are worn under the trouser leg and are made of chamois and well adjusted with silver or bone buttons; they may be worn either open or buttoned. The "chaparreras" (chaps) so extensively used today, are a development of the Spanish "zahones," but they cover the entire length of the leg. They are open at the sides and are buttoned after being put on over the trousers. They are usually made of leather or deer skin, and their use is essential for all exercises on horseback, since they protect the rider from the rubbing of the rope, as well as being a defense against thorns, dust and rains in the plains. (The chaparreras, however are not worn during the dance). The shoes worn with this costume should be of light tan leather or chamois, without buttons or straps, with elastics on the sides and having a rather high heel so that the heavy Amozoc spurs may be properly placed. A serape or Mexican blanket completes the costume. The classic Mexican sarape used by the charro is made in Saltillo, Coahuila; it may be of simple design or of most elaborate pattern and is worn folded over one shoulder. Now for an explanation of the meaning of the dance. There are eight steps, quite intricate ones. The first step represents the galloping of a horse. The charro, booted and spurred, is on his way to the china's house. In the second step he raps briskly on the door, but it is not opened to him because the china is not in. In the third step the charro walks across the corral in order to take his horse to the stable, and on the way, in the fourth step, he meets the china poblana. She coquets with him but keeps him at arm's length. The fifth step shows the charro drunk  probably to drown his sorrow. He is unable to guide his horse straight, as the sixth step indicates. The china poblana is touched. She turns toward the charro and the two start to flirt again. The charro signifies that he is all hers by throwing his hat on to the floor. The china in order to accept him takes the chic method of dancing on the broad brim of the hat. In the eighth and last step, both are hilariously merry and express their pleasure and happiness by dancing the "Diana." This, then, is the story of the Jarabe Tapatío, Mexico's national dance, which originally was danced in some Indian village of Jalisco, but is now known to all the world interested in dancing. Collaboration of translated for Real Mexico by Jeanne Maisonville. The china poblana was a trifle coquettish, perhaps, but at the same time she was modest and demure. She danced in a simple girlish fashion, holding out her skirts daintily, bending her body forward, and keeping her eyes, to some extent, downcast. American Indian and other folk dances for schools, pageants and playgrounds, collected by Mary Severance Shafter. Music arranged by Josephine Condon. New York: Barnes, 1927, 77p (OCLC 1488072). Contains Jarabe Tapatío. Folk Dance Problem Solver (1996), Society of Folk Dance Historians (SFDH), San Antonio, TX. Jarabe Tapatío. 1 Don't confuse this dance with El Jarabe Ranchero, the dance that beame El Jarabe de la Botella, described in the 1993 Problem Solver. They share several melodies. 2 Don't confuse it with La Raspa, also (erroneously) called the Mexican Had Dance, and described in the 1989 Problem Solver. 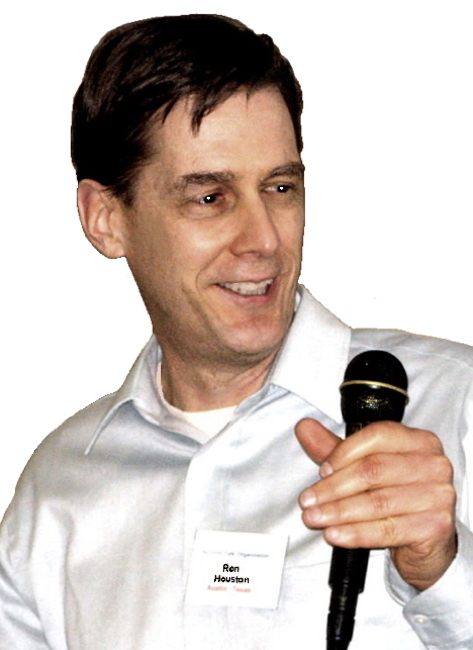 3 See the biography of Alurea in the 1993 Problem Solver. 4 Raffle, W.G. Dictionary of the Dance. New York: Barnes, 1964.